On April 4th, 2019 the Greenfield Police and Fire Commission unanimously appointed Captain Jay Johnson as Police Chief for the City of Greenfield. Chief Johnson started with City of Greenfield as a Police Officer in March of 1992 after serving the Town of Brookfield Police Department for 2 years. He was promoted to Police Sergeant in October 2001 and served in that capacity until being promoted to Police Lieutenant in February 2008. 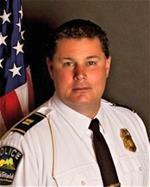 In January 2012, Johnson was promoted to Captain; a position he has held until his current appointment as Police Chief. Chief Johnson has earned an Associate Degree in Police Science, a Bachelor's of Science Degree in Criminal Justice, and is a Certified Public Manager through the University of Wisconsin program. Additionally, he is a graduate of the FBI National Academy and the International Association of Chiefs of Police Leadership in Police Organizations. Chief Johnson has served the Wisconsin Law Enforcement Canine Handler Association as a Board Member, Vice President and 11 years as President. Additionally, he currently serves as President of the Greenfield Police Foundation. The Greenfield Police Foundation has funded four Greenfield Police K-9's, station fitness equipment, and supported City events including The National Night Out and the Fourth of July Celebration. He is well versed in Unified Tactical Command, Internal Affairs Investigations, Emergency Management, Firearms Use and Instruction, Property Room Management, S.W.A.T., Female Awareness and Survival Training (F.A.S.T. ), and Citizen Concealed Carry Training.